The sun shone on the transporter and awning of Eclipse, but for over half of the hour long Saturday morning warm up it did not brighten the faces of the team personnel. After a test two weeks previously they had hoped for some speed, but Steve Hyde was marooned in 8th place, over 3 seconds off the pace at that time. He was called for a better set of tyres, but this had no discernable effect. Piers Johnson missed out on the test session so he was now installed in the e car and within a lap and a half knew there was something fundamentally wrong. The car was stiffened considerably to cure chronic oversteer and it seemed to work, the lap times tumbling. The session ended with 4th fastest time of 1.09.376. Still a little off the ultimate pace, but going in the right direction. A "soft" damper was suspected of being part of the handling problems, which meant a lot of time under the back of the car for it's long suffering mechanics. The weather caused a modification to the bodywork, a vent being opened in the passenger door window to allow a little more air through the cockpit. PI were also in attendance, a dash that needed resetting every time the engine was started, and some VERY odd data being retrieved from the system caused furrowed eyebrows for some time. The manic qualifying sessions brought more bad news, Steve Hyde struggling with no grip again and only managing to nail 10th on the grid, with a 1.11.377. " We need a bit of magic dust. It's OK down the straights, no grip at all in the corners. I hope the team can sort it out" he offered as he shed his overalls. Piers Johnson fared little better, 9th with a 1.10.273, and was just as unhappy with the car, calling it "nervous". A long debrief followed, and the back of the car was in pieces once again. It wasn't only the PI chap who was scratching his head. The data logger mystery was solved however, when it was found that the black box which controls the system was another victim of the Mondello crash. Suddenly the garage was in chaos, all hands thrown at the car in a mad dash as the race organisers decided to move the grid formation forward 10 minutes. The team worked like madmen to try and make the new deadline and just as they clipped the bonnet into place they are told the time has moved back again... They used the time wisely, checking the car again before a rather hot Steve Hyde fired up the engine and rolled out of the awning. A surprise greeted Steve when he lined on his grid position. A great hole met his gaze as he looked through a space where two cars should be. The Ultima and RSR TVR not making the grid. Not that best use was made of the tarmac, Steve slotted in behind the Ricky Cole driven Xero Corvette as he made an "average start". The beginning of lap 2 saw the blue and orange car monstering the yellow one. As they approached Richies it looked as if the TVR was going to try a run around the outside, but at the last moment it went right and barrelled past the Corvette.
" I stuck right up behind his left hand side giving the impression I was going to go pass him round the outside but at the last minute jinked down the inside and out braked him and JUST got away with it. What it meant was I was really slow on the exit of Richies. Into Sears he banged me in the back. I nearly stuffed it but it was a real buzz to get the place back". The Xero machine did not take this lying down, and the two cars started an intense and very enjoyable battle ruined when the American car lost a wheel. 6th place was secure. " Once the tyres came up, it was fine. A bit slow at the start but I'm just happy to finish after the start we've had this season". The pitstops out of the way, Piers Johnson rejoined in 4th, but he was finding the car less balanced and being stalked by Mullen in the Ferrari. 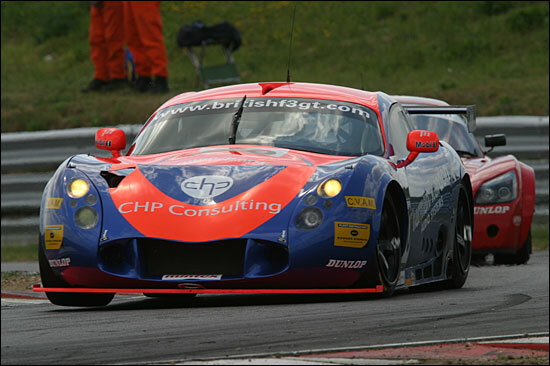 The Italian thoroughbred betttered 151mph on the front straight in pursuit of the now struggling TVR. The lap times climbing as high as 1.16 as the frantic battle for the lead led to Piers being put a lap down just before the end.
" Steering sensitive" was how he described the car. but he was satisfied with 5th, "a good baseline to work from for tomorrow". Sunday brought clouds, and more damper changes. A new PI system was fitted as the car was readied for the race. Piers Johnson got the car off to a good start but got behind David Jones in the Porsche and did not have the handling in the car to seriously challenge although it looked as if he could have gone faster. 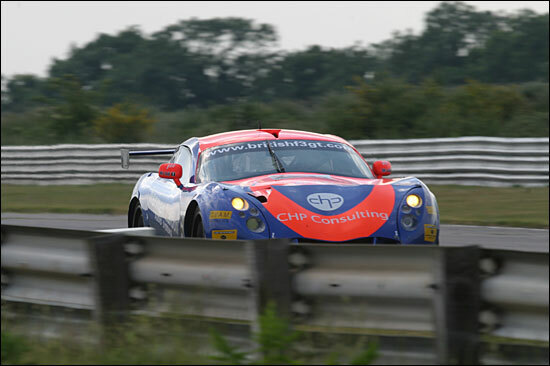 Mark Sumpter was in a real hurry, passing both cars in very short order. 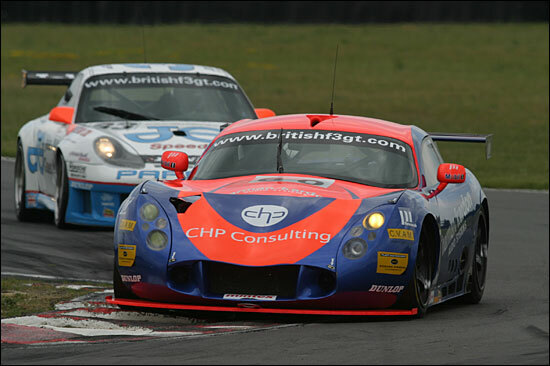 6th became 5th when Nigel Greensall retired the RSR TVR from 3rd place. Piers was much more upbeat at the end. "It was OK, a lot better than yesterday. 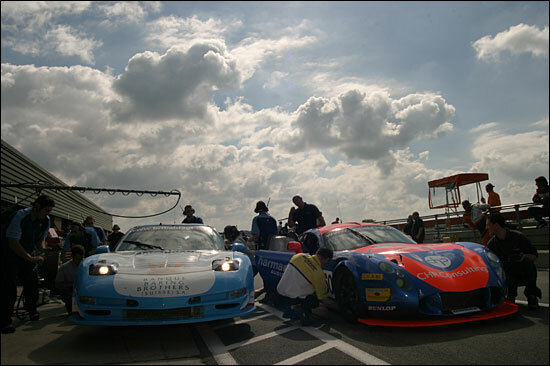 It was difficult to try to overtake or defend easily as the car is difficult to drive. 5th is good, two solid results". Steve took over the car, and slowly fell back from the raging Porsche battle ahead but brought the car home in that 5th place. 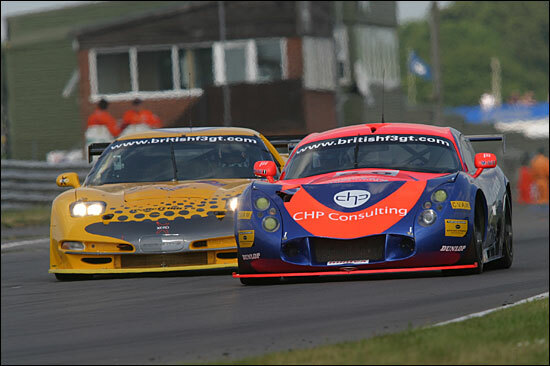 Such was the pace of this race the lead TVR was the last unlapped car.
" It was great to get two solid results out of the weekend. It has given the lads a lift because they've put so much effort in with nothing to show for it. 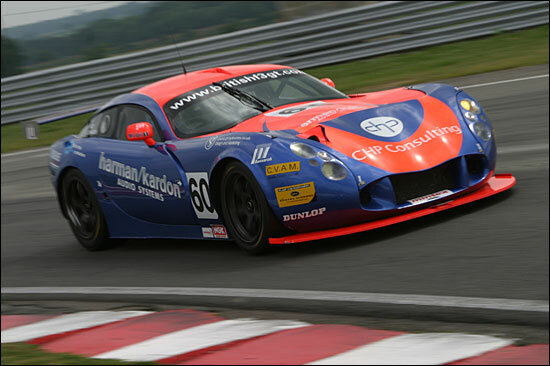 Two points finishes should give us a bit of confidence going to Castle Combe" said Hyde with the grin of a man whose next assignment is Le Mans in the Works Morgan. The last word must go to Chris Pollard as he handed out beers to the hard working troops. " 5th place is good, With the run we've had recently it is like a podium".